Today, virtually every other motor oil manufacturer has recognized the superiority of synthetic lubricants and has followed the AMSOIL lead by introductions of synthetic motor oils of their own although mostly are not 100% pure synthetic like AMSOIL is; they are Group III Hydroisomerized petroleum oils, marketed as synthetics under a new law. They spend millions of dollars advertising their “new” and “revolutionary” products. No one, however, can match AMSOIL experience and technological know-how. And no company in the world delivers products like AMSOIL. We are your one stop source for world's best ultra premium Synthetic Motor Oil and filtration products, which outperforms just about any other competing products like Mobil 1, Quaker State, Pennzoil, Castrol syntec and every other synthetic and conventional petroleum motor oil in the world. See the ASTM test results and learn the facts. AMSOIL saves you time and money. 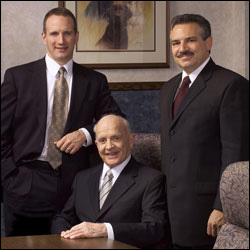 Under the leadership of Albert J. Amatuzio, along with Alan Amatuzio, Executive Vice President and COO (left) and Dean Alexander, Executive Vice President and General Manager (right), Amsoil remains the leader in synthetic lubrication technology. Amsoil, Genuine PAO Formulated Synthetic Motor Oils have shattered the parameters of the most rigorous industry testing and set the standard for all other motor oils. AMSOIL founder A.J. Amatuzio coined the phrase “extended drain intervals” back in 1972 with the introduction of AMSOIL 10W-40 Synthetic Motor Oil, formulated for 25,000-mile/one-year drain intervals. Not only was AMSOIL motor oil the first synthetic oil to pass American Petroleum Institute (API) service requirements, AMSOIL INC. was the only motor oil company promoting oil drains beyond 3,000 miles. Today, motorists are still bombarded with propaganda from the major oil companies promoting 3,000-mile oil changes. Amsoil Contact Forms regarding Opening Retail and Commercial Accounts, get product specific information for your vehicle, become an Amsoil Home Dealer or Preferred Customer and for general questions about Amsoil.